The farm was established in the late sixties by Rinaldo Rinaldini who, at the time, was managing a famous restaurant where wine and sausages were made by hand and where the menu offered the most authentic Emilian cuisine. The company is located halfway between Reggio Emilia and Parma. The love for the land, the admiration and knowledge of “Champagne” rites grew with time, and it was this that brought their family to become winemakers. They decided to save ancient vines, otherwise doomed to extinction. within few years it they showed that,even from land and vines battered by the producers and forgotten by the masters of wine culture, true miracles can happen. Today, the business retains its family character. In fact the full processing cycle, from the grape to the bottle, is managed by Paola Rinaldini with her husband Marco and son Luca. The cellar was converted from an 1884 farmhouse that stands at the center of the vineyards. Over the years it has expanded to new areas and cellars. One cellar is devoted to winemaking and processing and another one for bottling and packaging. All are equipped with state of the art facilities and equipment, so as to maintain the level of quality as high as possible, without forgetting the tradition and teachings based on experience. 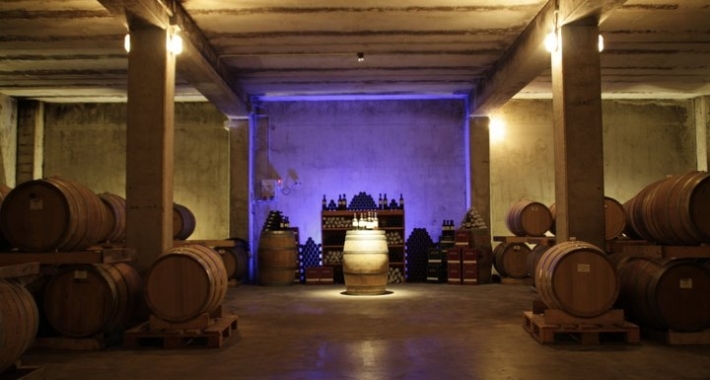 In the farm there two subterranean cellars have been created over an area of 1,000 sqm. The first was fitted in French oak and acacia barrels , where are matured the finest wines. The second is a real champagne “cave”, where you hone bottles of sparkling wine and the riddling is done manually. Here you can also find the bottles of wine laid down for aging before being put on the market. Furthermore the production comes exclusively from their own vineyards. In addition to their respect for nature they use modern machinery, which provide only small amounts of pesticides compatible with the environment. Rinaldini Lambrusco Vecchio Moro “Grasparossa” I.G.T.